Despite pleas from Nigeria’s President Goodluck Jonathan to members of the Peoples Democratic Party, PDP, to stop their ongoing verbal attacks at each other and concentrate on repositioning the party ahead of 2019, Governor Ayodele Fayose of Ekiti State, western Nigeria on Friday insisted he had every reason to demand for the resignation of Adamu Mu’azu, the National Chairman of the party. There had been calls for the resignation of sack of Mu’azu and other members of the National Working Committee of the party since the party recorded a woeful defeat at the 2015 general elections weeks ago. Days ago, President Jonathan waded in and urged the members to sheathe their swords and focus of strengthening the party ahead of future elections. Three party leaders in Britain, including opposition Labour Party leader, Ed Miliband and Liberal Democrats leader, Nick Clegg resigned on Wednesday after their parties loss in the election. 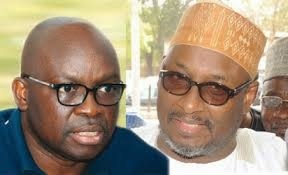 Reacting, Governor Fayose said: “Alhaji Mu’azu should be honourable enough to follow the same path as the British LP and Democrats leaders. “Mu’azu’s case is even worse than that of the British party leaders, who resigned immediately their party lost because majority of PDP members no longer have confidence in his leadership and there is no way a willing leader can be forced on an unwilling followers. “This is not about personality and I am also not operating here on empty boast because Ekiti State was delivered to the PDP 100 percent. “Rather, it is about issues. Imagine the PDP not getting up to five percent of the votes in Bauchi State, the National Chairman’s home state and someone is still not being honourable enough to resign. “Haven’t we now seen what operates in saner climes with the resignation of the British LP and Democrat leaders? “Shouldn’t our party National Chairman also take a cue from this and allow for fresh minds to steer the ship of the party at this difficult time?